Every year thousands of the world's youth pass through New Zealand as either backpackers, or as temporary workers. Of those adventurous thousand there are bound to be some who go on to acclaim or honours. William Dewey, author of the soon-to-be-released Without a Soul to Move, may be that vaunted visitor. Set in an impending winter in Denver, Colorado, Without a Soul to Move follows three men trying to extract meaning from their wilting lives. Their efforts are marked by varying degrees of sanity, from morbid social experimentation to vicarious relationship counselling and the late-night excursions of a costumed vigilante. The novel converges themes of suffering, love and absence into a graceful, but humourous narrative. Dewey describes the book as an attempt to find some useful outlet for the surge of emotions wreaked by the turbulence of his own life in the years leading up to its composition. Faced with the death of loved ones and self-imposed isolation in distant lands, writing a novel was the most constructive possible response he could come up with. 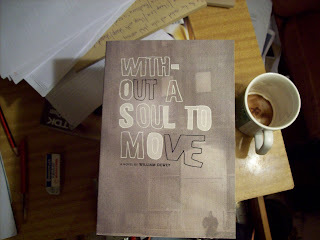 Unity Books and Lawrence and Gibson are proud to launch Without a Soul to Move on July the 5th at 5pm at Unity Books on Willis Street in Wellington. This launch will mark the fifth release of Lawrence and Gibson, and the third primary author to their stables. Mr Dewey will be present to offer sagely advice and Richard Meros will also be on hand to pontificate wildly on the book's underlying themes.